I am a collector of aprons. I am saying this out loud, to see how it fits. You see, it hadn't dawned on me that I was the owner of a ridgey-didge collection until I opened the draw this morning. There sat the pile of pretty - and mostly handmade - aprons. One apron: functional. Two: practical. Three or more? Well, perhaps its time to admit that you are starting to stockpile; accumulate; amass. The collection started when I was nine. It was an oilcloth full-sized apron with a robin pattern repeat. It was a birthday present from my parents and was found when we were living in England. Then later came a leaving gift from colleagues in Montreal. It was a blue plaid apron with a matching chef's hat. Soon after it was joined by a simple white number with a printed motif from Ecole Trois Points a cooking school near Lyon in France. That one has never been washed. As unsavoury as it might sound, the food stains remain for posterity. Next there was the pretty apron I couldn't refuse when Ms CurlyPops opened her shop. Pink and orange are impossible to resist. Then things went up a notch: the swaps started. Just what is the collective noun for aprons? Mr HB has already helpfully suggested that it might be an excess of aprons. This is my latest acquisition and its the loveliest apron. I received this from the very talented Debye at C Berry Baby in the Sassy/Flirty Apron Swap. (Do take a look at Debye's lovely blog and amazing online boutique). She has handmade this beauty from an Amy Butler pattern and used the most gorgeous prints. I love all the details on this apron like the series of pretty tucks across the bib. And Debye's sewing is beautiful. It really does feel like you are putting on a pretty dress (... albeit one that would expose your ... ahem ... derierre) when you are wearing this. I absolutely adore it - thank you so much Debye! And this was my swap package all ready to wing its way to my swap partner Karen in Salt Lake City, Utah, at the start of the month. 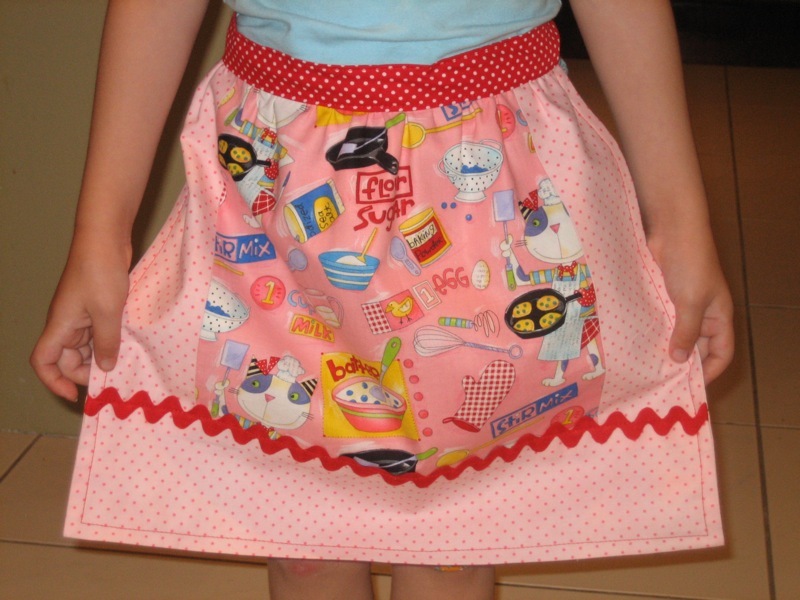 I really enjoyed sewing this apron for Karen, as it was all girly pink stripes and hearts. Such a refreshing change from diggers and trains! I used a vintage pattern reprint from Simplicity. I have used this pattern (3544) previously, but each of the views are sufficiently different that you feel that you are constructing a completely new style (this time I used view D). Whilst I love the pattern and would continue to sew from it, I do think the instructions are a little hazy in places. In fact it only occured to me after I posted the apron, that I had probably constructed the pockets incorrectly. Nothing too major; more an accidental cosmetic mistake enhancement. I trimmed my apron with pale pink homemade bias binding, that was dotted with little red hearts. I also made some heart appliques. Everything went smoothly, except for ironing Wonder-Under to my ironing board cover ... but that, friends, is a story for another day. Your swap aprons are gorgeous! I must admit that I have a bit of an addiction too, but I still manage to forget to put one on until I spill food all over myself. I have been trying to think up some good collective nouns for aprons and all I can come up with is a Protection of Aprons (hmmm must try harder). You have another beautiful apron for your collection I see but I do hope you made another copy of the heart apron because it is gorgeous - how could you bear to give it away. You know I have just recently discovered a bit of an appetite for aprons myself. I think the collective noun should definitely be an excess. There's nothing wrong with a little excess every now and then. Your swap aprons are so gorgeous. Truly gorgeous, both of the swapses. Next step: wearing aprons out of the house? You have done a great job on the swap and i love yr new one. Is that the new AB Goddess pattern? Oh my, it's just gorgeous! Your homemade binding is divine and I love the whole thing!! Super duper cute! Wow, you got lucky with your partern - that apron is gorgeous!! As is the one you sent - definitely my kind of apron. Not sure what you added to the pocket but it worked a treat! Ah, we love a collective noun over here. Aprons though... A protection of aprons, a pinny of aprons? Too damn hard! !